I heard about "When Crazy's Coming" on Goodreads, and I must confess I was curious to read it because… A) it sounded like funny chick-lit and a real, serious adventure in growth, both at the same time – a good combination… and B) the main character's name is the same as mine, although spelled a little differently, which piqued my interest.I was FAR from disappointed! Mikki is the narrator, and she has a genuine, down-to-earth, witty voice all her own. In some ways she's worldly wise, a successful career woman who's spent the last 18 years as a single parent raising a son. In other ways, though, she's an innocent – she hasn't paid much attention to her emotional side, and her disastrous relationship with her son's father has left her afraid to move beyond it. She's convinced herself that she doesn't need to move beyond it.This sounds like serious stuff, and it is. But this is a funny book. I had to laugh out loud on almost every page. Mikki didn't so much tell the story as show it to me as it happened, and her private thoughts and reflections on the events are often hilarious, partly because she can laugh at herself.The thing I really, really like about this book is how visual it is. The author puts us in Mikki's mind, behind her eyes, and we see the things she sees – often absurd, like her mother "wrestling" with a crab leg at Red Lobster. We also see the things she imagines, like a blob of gravy on a fat man's too-tight polo shirt turning into a tiny Mickey Mouse hanging ten on a surfboard, riding a big blue wave. I would LOVE to see all this, real scenes and imagined ones, as a movie. It would be sidesplitting.The book starts a little slowly, with Mikki introducing herself and other characters instead of moving the story quickly forward, and you might get impatient. But hang in there. If you like chick-lit, if you like to see a character gradually get to know herself better, and if you like to laugh, I highly recommend "When Crazy's Coming." I'm really enjoying this book! I usually read my books fast, but this one I slowed down with because I don't want it to end.Ok I finished it and didn't slow down reading it much! It has a great storyline with also some humor! The author's description of the characters and their environment was phenomenal. Awesome Book! I won a free copy from the Goodreads First Reads Giveaway Program and think that it interesting. I would recommend it to everyone. I absolutely love this book! The characters are so much fun & entertaining. Mikki is having quite the adventure. I don't want the book to end & can't wait to read more about Mikki. This is a very witty book, but took some while before I was able to connect with the characters. Perhaps because this is a genre that I seldom read. I would like to thank the author however for sending me a copy of this book, which I won in the Goodreads First Reads Giveaway some time ago. 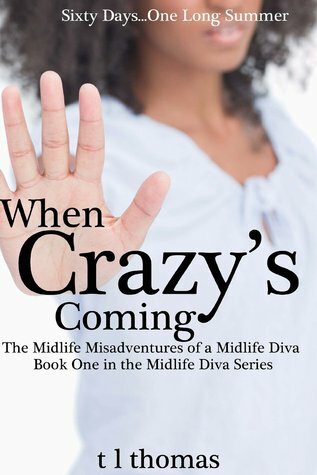 Trumillia Lunnie-Thomas - T L Thomas is the author of the "Midlife Diva" Series including "When Crazy's Coming, The Midlife Misadventures of a Midlife Diva, "Most Likely", "Any Other Time" and "A Thousand Other Yesterdays". When not behind the screen of her trusty Mac she can be found hiking, exploring nature reserves and photographing wildlife or reading the writings of her favorite authors, listening to jazz and of course - writing!